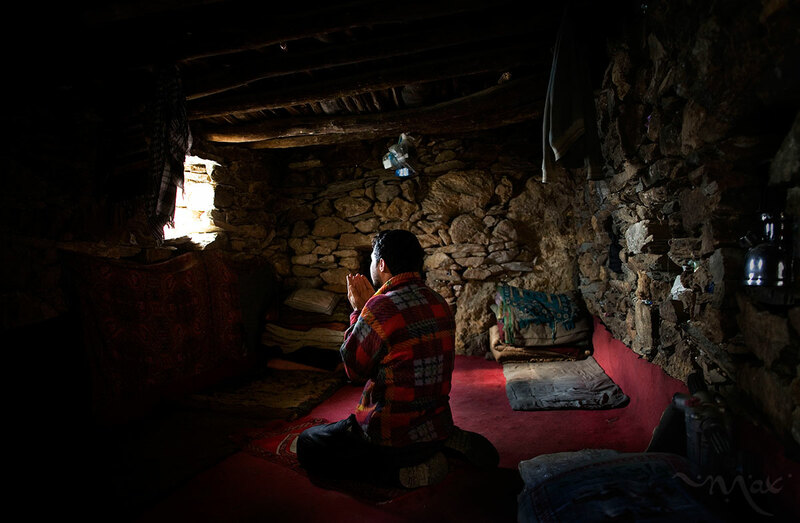 October 25, 2007- Khenj, Afghanistan: Burhan Amin, 26, prays in the one room stone he shares with the rest of his team of miners in the slope of the Hindu Kush mountains towering over the Panjshir Valley near the village of Khenj, in Afghanistan on Thursday October 25, 2007. Burhan Amin, 26, a partner and cousin of Mr. Jawead, has a kidney ailment that does not allow him to work, brought on from years of battling the mountain for emeralds. Instead of maning the rock drill, Mr. Amin prepares the meals of rice, bread, lamb meat and tea for grime covered miners. Even with this light duty, he sometimes feels too ill to work. “Most of the time I am sick. Those days when I am not feeling well, because there is the mountain and it is the work of the mountain. If we work from the morning till night, you will know how much you get tired,” Mr. Amin said.